For the first time in forever, your family can experience the magic of the Disneyland® Resort with significant package savings for most late winter and spring travel dates. 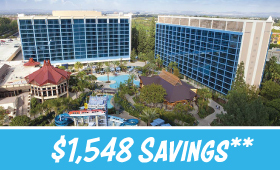 Travel January 7 - April 13, 2019 or April 23 - May 23, 2019, and a family of four will save $500 or more* when they purchase 5-Day 1-Park per Day Disneyland® Resort Tickets with one of our exclusive Extra Night Free Anaheim area hotel specials. Our packages automatically include 3-Day Park Hopper® Tickets. You can easily switch your included tickets to the tickets of your choice online when prompted. 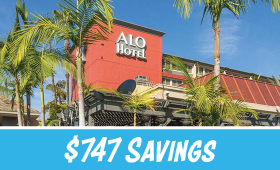 All packages below include a 4-night hotel stay, Get Away Today exclusives and four 3-Day Park Hopper® Disneyland® Resort Tickets for travel most dates January 7 - May 23, 2019*. 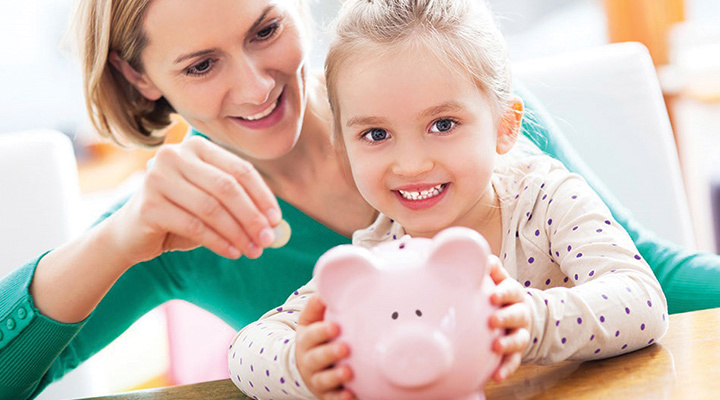 See all of our Disneyland® package savings by clicking here. Don't wait! Availability is limited and will sell out. Book your vacation as soon as possible online or call 855-GET-AWAY. Lock-in your low price for next year's vacation for just $175 down with our flexible Layaway Plan. Final payment is due just two weeks before travel. It's the easiest way to pay for your vacation! *Savings are calculated off of annual park pricing. Savings amounts will vary with ticket type. Spring ticket savings includes blockout travel dates of April 14 – 22, 2019. 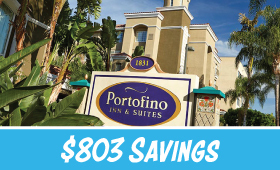 **Savings based on “4 for 3 offer” for the non-discounted price for the same room at the same hotel for most nights. Valid for travel between 1/6/19 – 4/11/19. 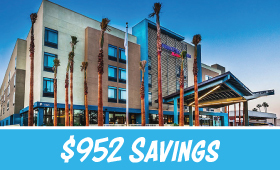 Book now through 3/16/19, with travel completed by 4/12/19. Premium room types included in offer are Premium, Deluxe and Woods/Garden/Courtyard rooms; select Concierge rooms; and Artisan, Junior and Regal suites. Ask about savings on other room types and other hotels. Not valid on previously booked rooms. Advance reservations required. Subject to availability as the number of rooms allocated for this offer is limited. Excludes applicable fees and taxes. Limit two (2) rooms per reservation and five (5) people maximum per room. Not valid in combination with any other hotel discounts or offers. Subject to restrictions and change without notice. Separate Theme Park admission required to enjoy the Parks.